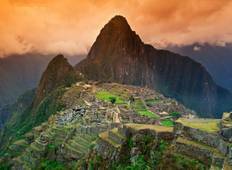 Explore a wide diversity of tours through Machu Picchu. We have 70 tours that vary from 3 days to 15 days. With the greatest number of departures in October, this is also the most popular time of the year. "Good classic coverage of Peru with Baillestas islands, Nazca lines and Macchu Pichu!..." "I LOVE traveling with Under30Experiences. The community that the company creates..."
"First trip ever with U30X was an amazing experience. Joel was a fantastic guide and..."